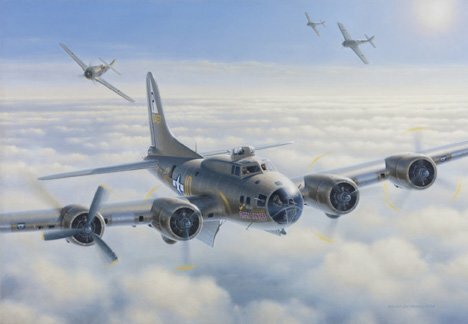 Image size: 17.5" x 26"
Print size 23" x 30.5"
On a bombing mission to Solingen, Germany, December 1, 1943, a B-17F "Flying Fortress" of the 384th Bomb Group, 545th Squadron is on its' 13th mission piloted by ship commander Lt. Bruce G. Sundlun. Over the target planes of the 384th encounter intense flak and "Damn Yankee's" #4 engine is hit and the propeller begins to windmill. Losing speed and altitude "Damn Yankee" falls behind the group and earns the dreaded title of a "straggler". Navigator, Lt. Reino O. Jylkka, gives the heading for England when suddenly tail gunner Sgt. Frank Lekas, calls out "enemy aircraft at six..." but had no chance to finish. Focke Wulf 190s, from Jagdgeschwader (JG 26), assault the "Fortress" from 6, 7, and 8 o'clock destroying the left horizontal stabilizer and tail gunner's cabin, killing Sgt. Lekas. One 500 pound bomb, caught in the bomb bay since the bomb drop, is released by bombardier, Sgt. George C. Hayes, who is killed by gun fire while in the doorway of the bomb bay. On the intercom an agonizing cry is then heard "Oh...they got me bad". Ball turret gunner, Sgt. Harry F. Cologne is mortally wounded. The fighters continue firing and the #2 engine is hit and begins smoking. Attempts to feather the propeller fail. The situation is now desperate, with the tail now shot to pieces, the rudder useless, the intercom out, the fuse box shattered and oxygen leaking freely. Diving and losing altitude fast, "Damn Yankee" reaches cloud cover but it does not provide sufficient cover. Fighters again assault the stricken bomber hitting the control cables, instrument panel, and automatic flight control equipment while severely wounding radioman Sgt. Charles L. Snyder. Gunners in the B-17 fire back a constant stream hitting two 190s, disintegrating one. At 5000 feet the #2 engine is on fire and partial control of the aircraft is maintained. With the ball turret crippled and the top turret gun jammed, the FW 190s shoot out both waist guns killing gunners Sgt. Chester P. Snyder and Sgt. Mike J. Cappelletti. Under extreme duress, pilot Lt. Sundlun and co-pilot Andrew V. Boles struggle valiantly to maintain control of "Damn Yankee". With hope of reaching England now gone and the ship in danger of exploding, the crew is ordered to bail out. Navigator Lt. Jylkka and top gunner Sgt. William M. Ramsey are the first to bail out through the nose hatch, and, after sending an S.O.S., Sgt. Charles Snyder bails out. As the ship rapidly descends from 1800 to 1200 feet any notion of a crash landing is abandoned. With barely enough altitude, Lt. Sundlun and Lt. Boles bail out over Jabbeke, Belgium. The crippled, out of control, B-17 rolls over in a sharp 180 degree left turn and crashes into a turnip field at 1240 hours. Of the five surviving crew members who had bailed out safely, only pilot Lt. Sundlun avoids capture by escaping to Switzerland. Personally autographed by the 384th Bomb Group, 545th Squadrons pilot Lt. Bruce G. Sundlun.